A recent European application by Mauro Schiavon was published on October 5, 2016. A method is presented for the continuous production of heavy electrons with extra mass values such that they can be captured by hydrogen ions and give rise to the generation of a neutron flux which optionally can be used to trigger and sustain a low energy nuclear reaction. This method is based on the physical phenomenon of Localized Plasmon Resonance (Local Surface Plasmon Resonance – LSPR). The present invention relates to a method for producing heavy electrons and the relative utilization of said production of heavy electrons in order to trigger and sustain a low energy nuclear reaction. As being reported, the European Patent Office has issued a patent for the Francesco Piantelli’s nickel-hydrogen reaction. Francesco Piantelli, Professor of biophysics, University of Siena (retired), has been working on Low Energy Nuclear Reactions (LENR) or Cold Fusion processes using Nickel and Hydrogen since 1989 and has collaborated with Sergio Focardi since 1990. A full text of the patent may be found on Daniele Passerini’s site. ECAT.com in Association with Andrea Rossi and Leonardo Corporation offers a platform for interested parties in the ECAT technology. 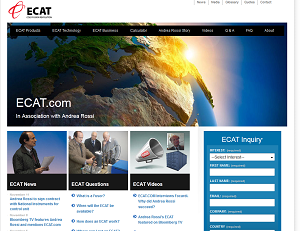 ECAT.com is currently, as the first site in the World, accepting pre-orders of ECAT products through the ECAT inquiry form on the right. These are non binding pre-orders but guarantees new customers a position on the waiting list which will be subject to a first-come first-serve policy.